SQUARING A TEST FIELD ENSURES EVEN DISTANCES BETWEEN PLOTS. FIELD TECHNICANS PLAY an important role in private and public research programs. Their work includes executing plans for research plots and gathering data from variety performance trials, field crop research, and breeding programs. Technicians come from a variety of educational backgrounds and many of their skills are learned through practical experience in the field. The University of Guelph used to provide a training course for technicians to reinforce consistent practices and ensure a strong support network for them was in place. Once this program ended, a lack of consistency developed in the way technicians trained. Grain Farmers of Ontario partnered with C&M Seeds and SeCan to host and develop a two-day training workshop that would better equip field technicians. The program, which was held in January, included topics that covered their roles, responsibilities, and best practices to use from pre-planting preparation to harvest. The workshop also covered new tools and new ways to manage plots to encourage technicians to incorporate the most efficient and effective methods currently available into their practices. University of Guelph and Agriculture and Agri-Food Canada (AAFC) supervisors and technicians were initially the target of this training, however, private industry and government field technicians also attended the workshop after learning about the event. DiMeo says they were pleasantly surprised that the workshop garnered so much interest and support from the industry. About 70 people participated in the workshop. “We envision that skills gained from this workshop will provide value back to Ontario grain farmers and the seed sector by ensuring quality and consistency of provincial performance trials and also ensure that seed from breeding programs has reliable data to support the yield, disease, and other improvements the seed has been developed to offer,” says DiMeo. The workshop was also a networking opportunity for field technicians to meet with their counterparts from the public and private sectors. It was important to foster these relationships so that technicians could reach out to each other and to the featured speakers for help with any future problems or questions. Among the participants was Malcolm Campbell, vice president of research at the University of Guelph, who reinforced the importance of doing program work correctly from the start as it affects not only the outcomes of scholarly research, but the day to day lives of people using the technician’s data to make decisions and ultimately improve their livelihood. The organizers hope this type of training will be picked up by the University of Guelph so that it can be offered in the future on a more frequent basis. The goal is to offer more hands-on training and lessons from the field that showcase real-life examples of how to overcome unexpected challenges that can occur with field research. 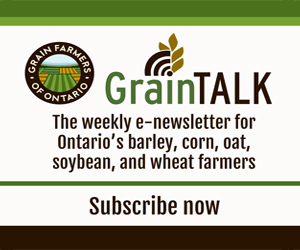 There are lessons from the technician training that Grain Farmers of Ontario plans to share with our farmer-members in articles within the Ontario Grain Farmer over the next couple of months. These lessons may benefit farmer-members involved with on-farm research or those interested in doing some of their own field experiments. The first topic covered at the training workshop was pre-plant preparation and planting. Ellen Sparry, general manager of C&M Seeds and the performance testing coordinator for the Ontario Cereal Crops Committee, led this session. Sparry first reiterated the importance of communication between supervisors, field technicians, on-farm cooperators, and staff from other partners. This starts with confirming participation of farmer cooperators who may not have been in contact with field technicians over the winter to ensure their land is still available for the study. Sparry highlighted common ways that mistakes occur, including measuring errors, faulty or uncalibrated equipment, staff inexperience, and incomplete training or instructions. To prevent the issue of faulty equipment, pre-plant maintenance on your seeder is important. This includes getting any lingering repairs completed, following an annual maintenance schedule, and checking hoses and mechanisms for debris and blockages from mice and birds. Calibration of your equipment should be done annually and follow the recommendations of the manufacturer. Yield monitors and scales provide important data that can influence your management decisions the following year so it is vital that they are accurate. Another aspect of planning for a field trial is selecting a good location. Ideally, it will be a flat and uniform field with a known planting history. This includes knowing the soil type, soil fertility, organic matter levels, pH, previous tillage practices, areas with known moisture or compaction issues, past weed issues, and previous crops grown in the field. It’s also important to note the location of wind breaks, roads, buildings, and manure storage which have the potential to negatively influence the growth of crops planted in the test field (ie. results may be invalidated by the runoff of manure from farm yards, shading, or wind). Once your location is selected, it’s standard practice to ensure a good square plot area by squaring off the field plot. If you don’t have GPS capabilities or a surveyors tool, you can use a 3-4-5 triangle (see image) to set a 90° corner. This ensures a good square plot area with even distances between plots, helps eliminate biases that can occur from uneven spacing, and can make maintaining the plot easier. Another often overlooked aspect of planning for a field trial is the need to make sure the entire test plot is planted on the same day. You need to check the weather forecast and ensure you have ample time to plant. Farmers need to be open-minded when cooperating with researchers and be willing to accept that sometimes not everything goes according to plan. Researchers take on the risk of failure so that ultimately farmers don’t have to risk their livelihoods with unconfirmed management practices.